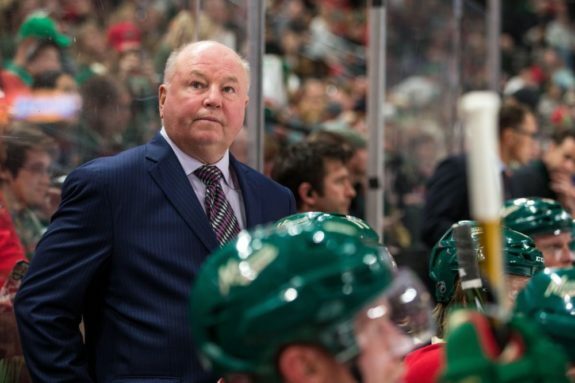 Wild Thinking: Smart Decision Choosing Boudreau over Yeo? The Minnesota Wild are only on coach number five. The 2017-18 season is only their 17th season in the NHL after joining in 2000-01 (2004-05 season was cancelled due to lockout). That means each coach lasts roughly three and a half seasons. Still the only standout season is the 2002-03 season in which Jacques Lemaire led the team to their first western conference final, getting swept by the Anaheim Ducks. That year he also won the Jack Adams trophy. The Wild have since gone through Todd Richards, Mike Yeo, John Torchetti, and are now employing Bruce Boudreau. Although the Wild failed to clinch their second division title in Boudreau’s first season, they did manage their best regular season in franchise history. The team set new franchise records in wins at 49 and points at 106. The previous best marks were set in 2006-07 with 48 wins and 104 points. The Wild also topped their goals scored record with 266, beating their 2006-07 total of 235. If you’re asked who the greatest coach in Wild history is, most will say Lemaire. However, Yeo (in roughly 300 less games) had posted a better winning percentage in the regular season and the playoffs. He ranks second all-time in Minnesota for both wins and points. He led the Wild back into the post-season for three consecutive season, making the divisional round twice. His stint in Minnesota was short, but he managed to guide his team to relative success. The next season, Yeo was hired as Ken Hitchcock’s replacement for the vacant head coaching position of the St. Louis Blues. The team hired him because they had no hope of the playoffs. Yeo took over and led the team to a 22-8-2 record to close out the season. The 46 points were enough to push them into the third central seed, enough to earn them a trip to St. Paul, MN. Every Minnesotan should have seen this coming, a 4-1 series upset victory to allow the Blues an opportunity to play in the second round. Yeo got his revenge. Boudreau has a ton of NHL coaching experience, having coached over 750 games at the pro level. He has coached three teams (Capitals, Ducks, Wild) in 11 seasons. Boudreau has won eight division titles, four with the Capitals and four with the Ducks. He was fired mid-way through his fifth season with the Capitals, being scooped up by the Ducks and leading them to fifth in their division. Boudreau coached the Wild to second in the central division in his first season with the team. Boudreau is certainly a different coach than Yeo. Boudreau is more of an offensive minded coach, his one full season in Minnesota led to improvements in many offensive categories. He has a vocal demeanor on the bench, never afraid to voice his displeasure with officiating. This is much different than the quiet Yeo, who encouraged strong defensive play. Boudreau is surely the better choice as his personality meshes with the team better. Nine times has a Boudreau team made the playoffs, eight of those being first place in his division. Five times he has gone home without advancing, three times losing in the second round, and losing a series 4-3 in his lone trip to the conference final. His total record in the post-season is 42-43 (1-4 with the Wild). The biggest knock on Boudreau has been his inability to win in the playoffs, seeming to lose his magic after the regular season concludes. Boudreau has led Minnesota to fifth place in the Central Division so far. In 44 games played, the Wild are 23-17-4 with 50 points. Yeo has led St. Louis to third place in the Central Division. In 46 games played, the Blues are 26-17-3 with 55 points. The Wild have scored 127 goals, compared to the Blues 134. Defensively the Wild have let in 127 goals, while the Blues have let in 122. The two teams are not that far off this season, and their success will again be determined in the post-season. Chuck Fletcher is sure to be on the hot-seat if Minnesota fails to make the playoffs this year. Losing Mike Yeo to the St. Louis Blues, makes the rivalry more intense. 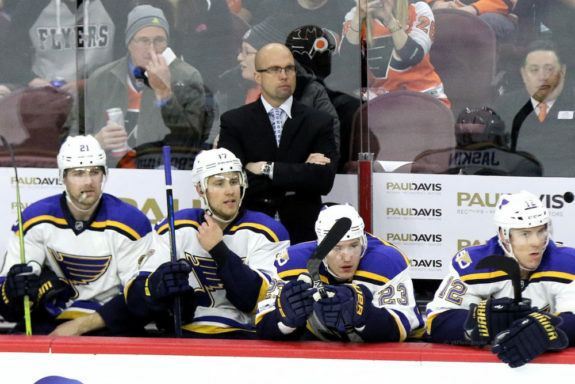 The teams will continue to be compared to one another until Yeo is no longer behind the Blues bench. Both are good coaches who do great things during the regular season, but the playoffs are an entirely different game. The race is on, which coach will earn their Stanley Cup first?